Took the day off from fishing charters on Sunday to get some downtown and enjoy a day with my buddies. Our schedules don’t link up like they used to so whenever we get a chance to link up and go fishing we jump all over it. We left out of Gulfport Municipal Marina at 7 am and headed towards St Pete Beach to catch baitfish. For charter captains catching bait can be one of the hardest tasks of the day and often goes unseen. 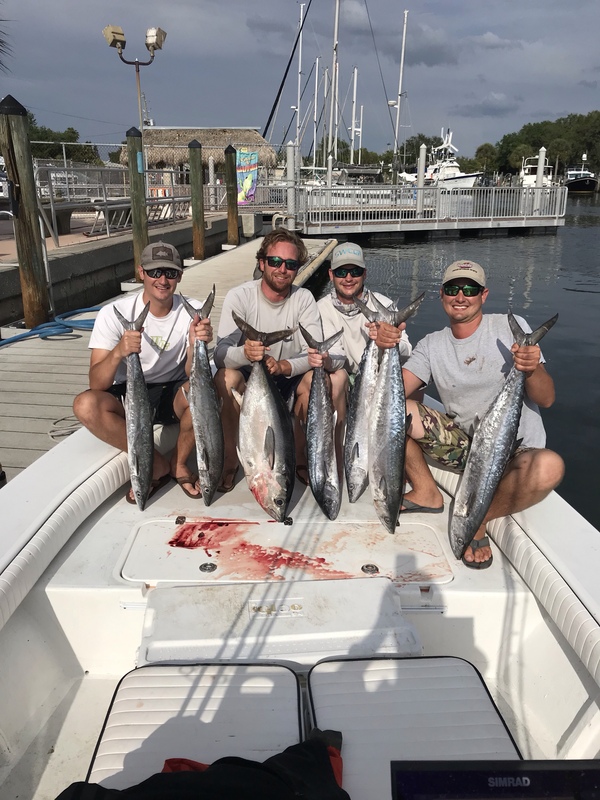 On most charters I catch bait before ever picking my clients up, but today I brought my buddies along with me for them to see first hand the labors charter captains go through to ensure they are baited up for the day. After spending about an hour netting bait we ran out towards Egmont Key and the shipping channel that leads towards the Sunshine Skyway Bridge. The shipping channel starts nearly 20 miles offshore and runs almost the entire length of the bay allowing ships access to the Port of Manatee and the Port of Tampa. This channel was dredged to be roughly 50 feet deep and in the process created new habitat for lots of different species of fish. Every spring the bait fish flood the channel in abundance and where there is bait, you can be sure to find predators! Fishing in or near the shipping channel provides a unique experience for customers as we often get to see large ships and barges from around the world coming and going right by us! Once we got to our first spot we had a kingfish on in just a few minutes and we kept them on for several hours! 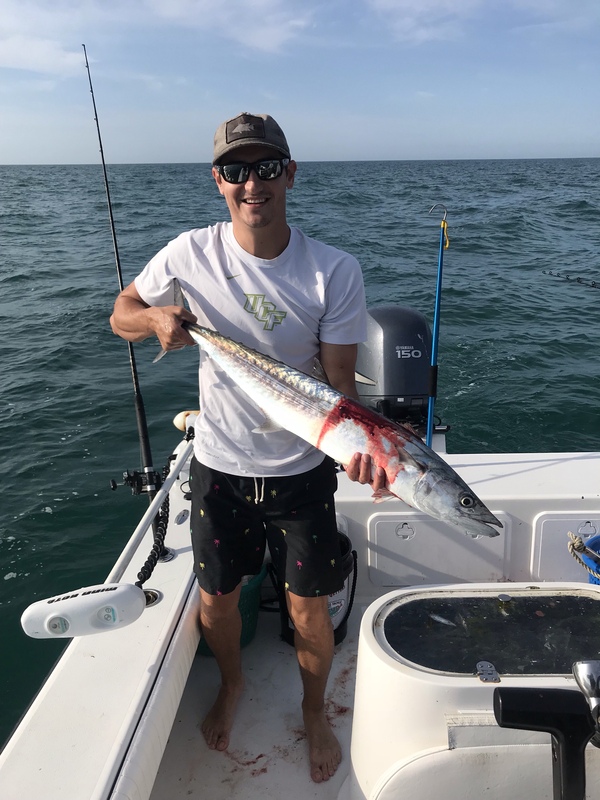 The bite was HOT and kept the boys busy reeling in these smoker kingfish. We boated 6 and lost a few more to pulled hooks and even had one get eaten by a large hammer head shark. Having sharks attack fishing while reeling them in isn’t common but it isn’t out of the ordinary either. Most days it provides anglers with a great opportunity to catch a shark but today we opted to go in search of a different quarry. We ran over 25 miles offshore into the Gulf of Mexico in search of black fin tuna. Our first spot proved to be just the ticket with tuna jumping out of the water all around the boat chasing bait fish. Black fin tuna aren’t often a common target on our charters but today we decided to have a go at them. 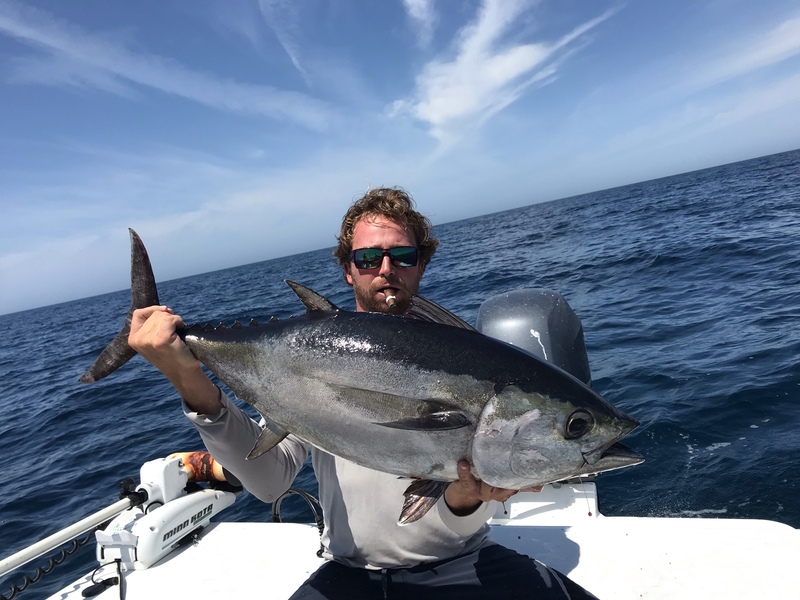 I don’t often get to reel fish in any more but today I would be the lucky angler to get to reel in a beautiful 28 pound black fin tuna! We would catch a few more Bonita but that would be it for the tuna for us. We headed in towards St Pete Beach to grab lunch at the Warf, one of St Pete Beach’s finest on the water dining and drinking establishments. I often take my fishing charters here for lunch or send customers here to have their fresh catch cooked and have never been disappointed! Great times with great friends and back to work tomorrow!